Do you cringe at the thought of cleaning your shower glass doors? Do you have stubborn streaks and spots and maybe even a green tinge that all refuse to budge until you scrub with all you’ve got? Well, you don’t have to scrub for hours on end, there are some rather easy methods of cleaning your shower doors so they sparkle and shine just like they did when they were new. Vinegar is the perfect cleaner for soap scum and hard water spots. All you need to do is dip your sponge or rag into white vinegar. Coat the door and continue applying the vinegar. Do your best to keep wet vinegar on the shower door for at least five minutes. This will allow the hard water build up and the soap scum to dissolve and become a problem of the past. If you have stubborn problems, you can try boiling the vinegar and then applying it. Just be very careful doing this. Once your door is clean, rinse it with warm water. Soap scum is harmless, but mildew (or mold, which is actually the same thing) might hurt you. This black, pink, or green growth likes to show up your shower doors, particularly around the edges. Mildew is actually a fungus and if you are allergic to mold, it might make you sick. No matter what you call it, you can easily get rid of mildew with either hydrogen peroxide or chlorine. All you have to do is spray it on the area and wipe it and it kills the mildew. If the mildew gets behind the caulk, it will need to be replaced. To prevent soap scum and hard water from building up on your door, you can apply car wax to your shower doors. It seals the surface making it harder for anything to settle on the door. To keep mold from growing, leave the shower door open after using it to allow the air to circulate. 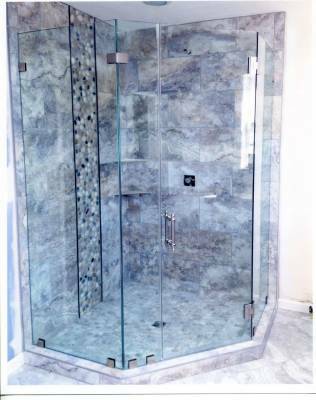 Keeping your shower glass doors looking great does not have to be an impossibility. If your shower doors are beyond repair, though, you can contact us and we'll help you with the next step.